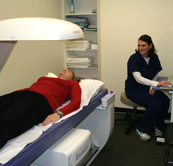 Bone density scanning, also called dual-energy x-ray absorptiometry (DEXA) is an enhanced form of x-ray technology that is used to measure bone density. It is typically performed on the lower spine and hips. It is used to diagnose osteoporosis and assess an individual’s risk for developing fractures. It is quick, noninvasive and uses less than 1/10th the dose of a standard chest x-ray. Osteoporosis is a debilitating bone loss condition that affects one in three women after menopause. Although osteoporosis typically afflicts women, men can also develop bone loss. For women, a baseline scan is usually recommended at age 50 or post-menopausal. Subsequent scans are generally ordered every 2 years.